In the last hundred materialistic years I was fascinated to discover that there are 386 recorded instances of Mary appearing to people all over the world from Belgium to Japan, Venezuela to Burundi and Rwanda. I had always supposed that the visions of Our Lady of Fatima, and at Medjugorje in Yugoslavia were unique one-off events. They are not. Our Lady of Zeitoun appeared regularly over a church at Zeitoun, a suburb of Cairo for several years between 1968 to 1971, where she blessed the people. Photos of the figure of light with a halo, hovering above the Coptic church of St Demiano appeared in all the Cairo newspapers. Hundreds of thousands flocked to see her, Christians, Jews, and Muslims, even the President Nasser. And there have been more reports of her appearing in Cairo just recently. But mostly Mary seems to appear privately to women, and children. The most famous, of course, in the 20th century was Our Lady of Fatima, who appeared on the same day for six months in 1916 to three Portuguese children, aged ten, nine and eight, while they were tending goats. After the third month of their visions, when crowds began to follow them the local mayor arrested the children, as he thought the events were so disruptive. He put them in jail among other prisoners, and threatened to boil the children in oil ( charming! ) if they didn’t tell him the secrets Mary had imparted to them. ( the secrets seem to have been coloured by the children’s perceptions of hell and Catholic teachings) They refused, though the eldest offered to ask Mary if she could tell him. The other prisoners testified that the children consoled them and recited the rosary with them. Back home, the youngest brother and sister told their parents that Mary had told them they would die soon and meet her in heaven, but their cousin Lucia, the eldest, would live long. Many phenomena were reported at Medjugorje during the appearances of the Queen of Peace as she is known, such as the sun spinning, dancing in the sky, turning colours, or being surrounded by objects such as hearts or crosses. Onlookers have reported that they have been able to look at the sun during those times without any damage to their eyes; these events are all similar to phenomena seen during the visions at Fatima in 1916. There too, newspaper reports described the sun dancing and spinning in the sky and changing colours. Reputable witnesses saw the solar phenomena forty miles away, while others, including believers, saw nothing. Among Mary’s many names are Queen of Heaven, Star of the Sea, The Blessed Virgin. In other places and other times the feminine principle or Divine Mother has been known by many other names… She’s been called Ameratsu and Cannon in Japan, Kuan Yin in China, Tara in Tibet, Shakti in India, Akua’ba in Africa, Isis in Egypt, Ishtar and Astarte in the Middle East, Hera and Juno in Greece and Rome, Freya in Scandinavia, Spider Woman and Ixchel the Weaver in North America. The Divine Mother has a long history in the planet’s consciousness. Archaeology suggests that from approximately 40,000 BC to approximately 5,000 BC the Goddess was worshipped above all, and nearly all the figurines found from this period seem to be female goddesses. She spoke to him in Mandarin and surprised him with her childish voice, much younger than Bernadette. “ Come, Elder Brother”, and she led him to a shallow cave, where he lay down and fell deeply asleep in the bitter cold and on hard rocks, unconscious of any discomfort. For more than a year he thought it was Bernadette who’d rescued him, until he saw by chance a portrait of Kuan Yin with her two attendants. In Ling Nu, the youngest, he recognised the lady who had saved his life. 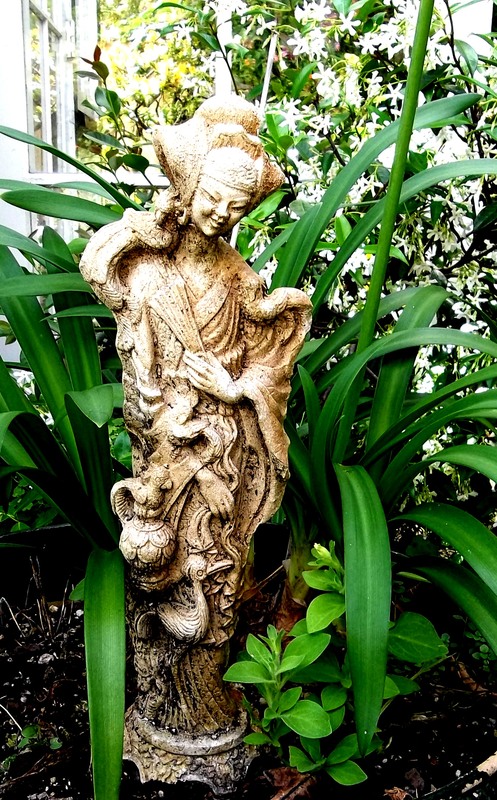 After deep thought, he decided that Kuan Yin had too much delicacy to appear to someone calling on a foreign goddess, so she sent Lung Nu who could be taken for a child saint. She seems to favour quiet spots far from towns and villages, by streams and grottos and woods, and her visitations come unbidden. The Catholic church is never very happy about Mary’s appearances – or you could say is suspicious – since it considers the last word to have been spoken on the faith after the death of the last apostle. So they don’t want her interfering! Reports of visions of the Lady are rarely greeted with any enthusiasm by church authorities and they have very strict criteria about who they believe. Out of the 386 visions/ appearances/ apparitions – depending on who is describing the visitations – only eight have been officially approved by the Catholic church. I wonder how many private and unrecorded visions – not just of Mary, but of other figures of spiritual significance – there are among people who have never spoken of them. I’ve heard of several. Graham Green, the novelist, writing of her, said: ‘There is a common feature in all her appearances, the appeal for prayer and yet more prayer. Her message is as simple as that, and it may seem unimportant unless we have some realisation of the terrible force of prayer, the mysterious untapped power able to move mountains’. Soup is the answer when I can think of nothing else, and this quick warming tomato soup is a favourite. Gently fry an onion, five cloves of garlic, a small piece of chopped ginger, and a good pinch of coriander in a saucepan until soft. Add a teasp of smoked paprika, two tins of chopped tomatoes in puree and one tin of whole tomatoes. While it simmers, leave a small bunch of herbs like thyme and marjoram tied together in the mix. Simmer for ten minutes, remove the herbs and blend until smooth. Re-heat, season with salt, freshly ground black pepper, and stir in some cream… this amount serves six. Sprinkle chopped parsley on top, and freshly cooked croutons made from sour dough bread and fried in olive oil are good too. It came to me that every time I lose a dog they take a piece of my heart with them, and every new dog who comes into my life gifts me with a piece of their heart. If I live long enough all the components of my heart will be dog, and I will become as generous and loving as they are.